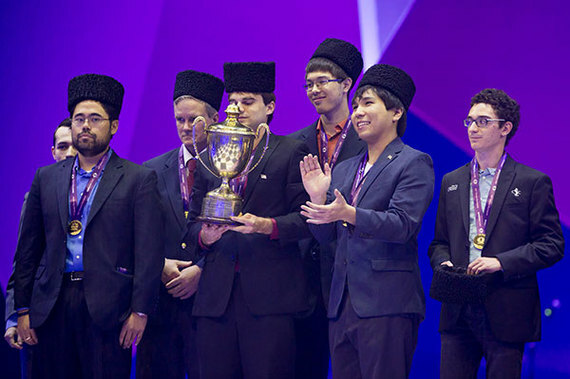 The United States bested 170 teams and won the 42nd World Chess Olympiad in Baku, Azerbaijan. At the closing ceremony last Tuesday, they received the gold medals and the traditional Azerbaijani hats - the papaqs. Sam Shankland raised the Hamilton-Russell trophy that travels with every winning team until the next olympiad. For the next two years, it will be displayed at the World Chess Hall of Fame in Saint Louis, Missouri. The last time the United States won was 40 years ago at the 1976 Chess Olympiad in Haifa. At that time, the gold medals hung on one single game that was out of our hands and lasted 14 hours and 111 moves. It ended in our favor. The last round in Baku was even more of a nail-biter and the gold depended on a single move. Only when an Estonian player took a wrong turn and lost to his German opponent could the Americans celebrate. Why was it so close when they did almost everything right? They finished undefeated with 20 match points, winning nine matches and drawing with Russia and the Czechs. But the team of Ukraine also scored 20 points. They lost to the U.S., but beat all the other teams, including the defending champions China and the top seeded Russia. It was down to a complicated tiebreak, an antiquated entity based on the results of other teams. Russia secured the bronze with 18 points. China won the gold in the Women's section. Poland clinched the silver medals with a better tiebreak over the bronze Ukraine. The current finance minister of Latvia, Dana Reizniece-Ozola, surprised everybody with a fine victory over the Women's world champion Hou Yifan. Ukraine won the Gaprindashvili Cup, one country combined results from the Open and Women sections. Baadur Jobava of Georgia had the best result on the top board (8/10). Eugene Torre, 64, played in his 23rd Olympiad, a record, and scored the most points (10/11). The world champion Magnus Carlsen led Norway to its historically best fifth place. Carlsen will be promoting chess in New Jersey next week, playing an exhibition match against Fabiano Caruana (see below) before starting his preparation for the World Championship match scheduled for November in New York. Caruana and Wesley So were undefeated. Hikaru Nakamura was the workhorse, playing all 11 games, and was almost knocked out by a cold in the last few rounds. Sam Shankland did well until the last round. Ray Robson's unfortunate loss to Alexander Grischuk of Russia made it hard to put him back in the lineup. The U.S. team captain John Donaldson pointed out that the team had great chemistry, the players were helping each other despite their individual rivalries. Donaldson had several great achievements as team captain. Baku was his 12th Olympiad. The U.S. team won one gold (2016), one silver (1990) and four bronze medals (1986, 1996, 2006, 2008) under his leadership. He also led U.S. teams at the World Team championships (gold 1993, silver 1997 and 2009) and Pan-Am championships (gold 2013). In 1984 in Thessaloniki, the U.S. team defeated the Soviets, but the Russians won the gold anyway. England finished second and we were in a fight for the bronze with the Hungarians. After three draws, I beat Lajos Portisch on the top board and we ended third by a half point. With his looks, determination and mental strength, Caruana resembles a Tour de France climber and he brings these attributes to the chessboard. The U.S. champion finished undefeated in Baku and was instrumental in beating Ukraine. After three draws, he masterfully exploited a better pawn structure. His win kept Ukraine out of the top spot. The material is equal, but White has a strong distant passed a-pawn and the black split pawns are weak. In time pressure, Eljanov commits a sin: he immobilizes his own rook, allowing Caruana's a-pawn a free ride. Giving up the pawn immediately does not help: 38...c5 39.Re4 Ra7 40.Qxc5 Rd7 41.a5 and Black has to worry not only about the a-pawn, but also about his own e-pawn. A. 41.a5 41...Qxe3 42.Rxe3 c5 (42...Kf8 43.a6) 43.Kf1 Rf4 44.Ra3 c4 45.Ra4! The pin allows White to keep his rook behind the a-pawn. His King is close to the c-pawn and White wins easily. Black cannot win the a-pawn, since he gets mated: 44...Ra7 45.Rxe6 Qxa6 (45...Rxa6 46.Re7+ Kh8 47.Qe6 Ra8 48.Qf7 mates soon.) 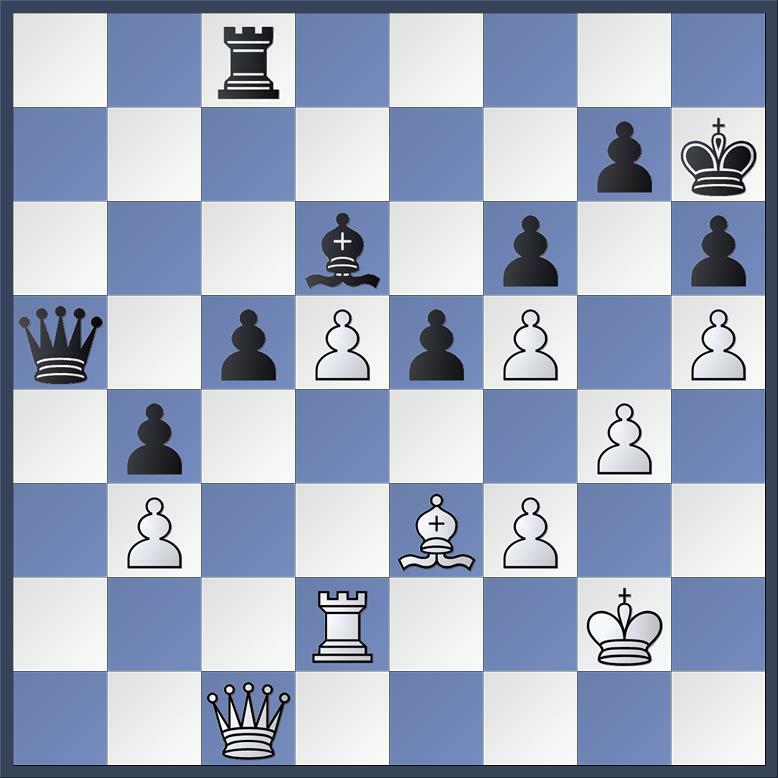 46.Qe5+ Kh6 47.Qf4+ Kg7 48.Qf6+ Kh6 49.Qf8+ Kg5 50.f4+ Kh4 51.Qh6 mate. The a-pawn is faster in the queen endgame. After 48...Kxf7 49.Qa2! a nice double-pin along the diagonal a2-g8, forcing the black queen to the a8-square. 49...Ke7 50.a7 Qa8 51.Qb2 g5 52.Qe5+ Kf7 53.Qe4! and White queens. 53...Qxa7 54.Qxh7+ wins. White wins after 49...Kg8 50.Qc5; or 50.Qb8+ Kg7 51.a7 Qd5 52.a8Q Qd2+ 53.Kg3 Qe1+ 54.Kf4 and there is no perpetual check. 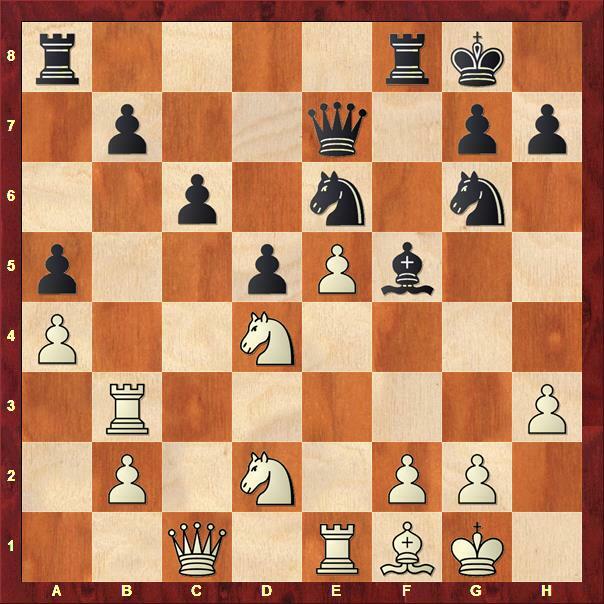 Threatening 54.g5+ Kh5 55.Qg4 mate. In 1986 in Dubai, the United States beat the Soviets. After three draws, Garry Kasparov had a better chances, but his awkward winning attempt backfired and he lost to Yasser Seirawan. But my loss to England's Nigel Short and Yasser's last round loss to Bulgaria's Kiril Georgiev had more impact on the final outcome. Although we were leading going into the last round, we ended up with the bronze medals. Wesley So also didn't lose any games in Baku and with his win with the black pieces against Ian Nepomniachtchti secured an important tie against Russia. His opponent won the first seven games, but Wesley didn't give him any chances. Preventing the pin Bc8-g4, but the pawn can later become a target. A flexible move So might have discussed with Caruana before the game. After establishing his knight on f4, So changes the dynamics in the center. Wesley expected the queenside blockade 18.a5. 19.Nxe5 Nxe5 20.Rxe5 at least opens the third rank for the other rook. A strong positional move, fixing the queenside. 20.Qc1 Qe7 21.Rb3 Bf5 22.Nd4 Ne6! 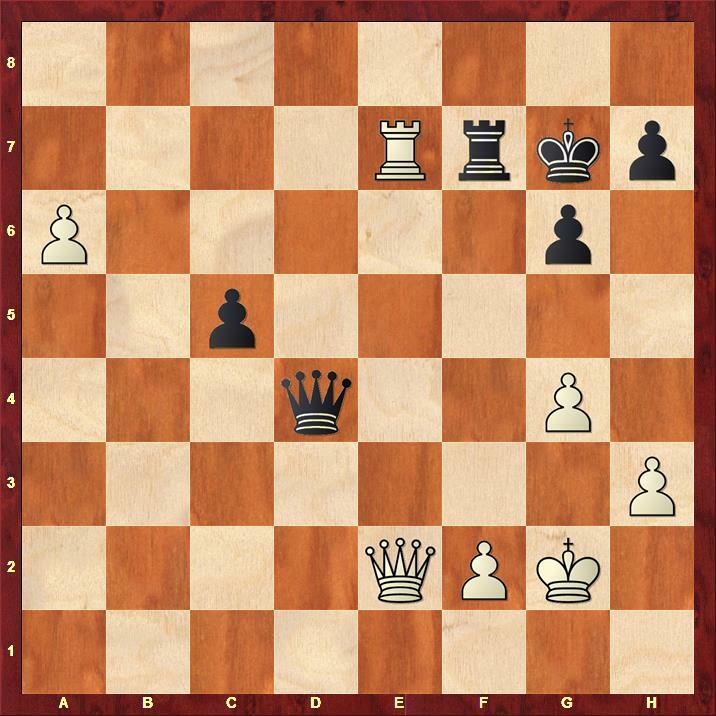 Leaving Black with a beautiful blockading knight on e6. 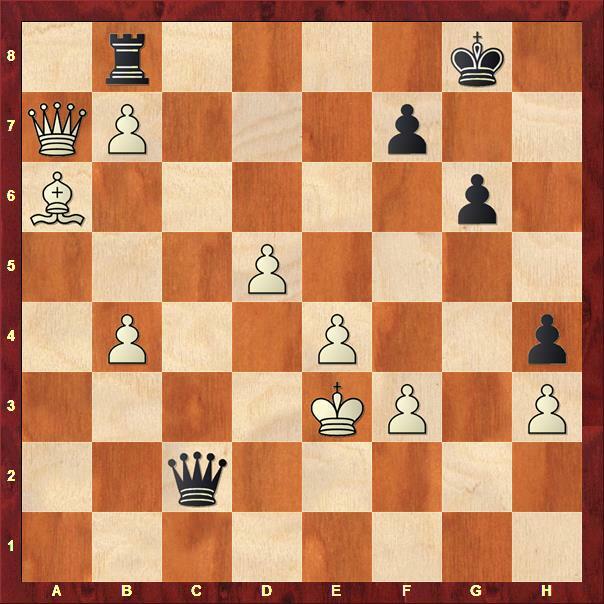 The black pieces are flooding the kingside and White cannot attack any weaknesses. Nepomniachtchi should have tried 23.Nxe6 Bxe6 24.g3 Rf7 25.f4, although after 25...Raf8 Black threatens to break through with a knight sacrifice, for example 26.Qd1 Nxf4 27.gxf4 Rxf4 with a good compensation. After 24.Nf3 Raf8 Black is ready to strike. Wesley takes over control of the game and his positional pressure is mounting. 29.Qc2 could be met by 29...Qc5 30.Qxc5 Nxc5 31.b3 Kf7 and Black will soon pick up some pawns. This is the first bonus, devoid of danger. A frustrating position for White. Wesley converts it slowly into a win. 30...Re4 is the other way to go. 34.Qxc4 dxc4 35.Ra3 b6 does not bring White relief. 41.Rxf3 Rxf3 42.gxf3 Qxe5 is hopeless. After 43.f4 Black can block the e-pawn with the King: 43...Kf8 since 44.Qxa4? Qb1+ mates. 43...Rh6! 44.Rg4 Qh5 45.Kf1 Qxg4! 46.fxg4 Rh1+ wins faster. The feast will be over soon. 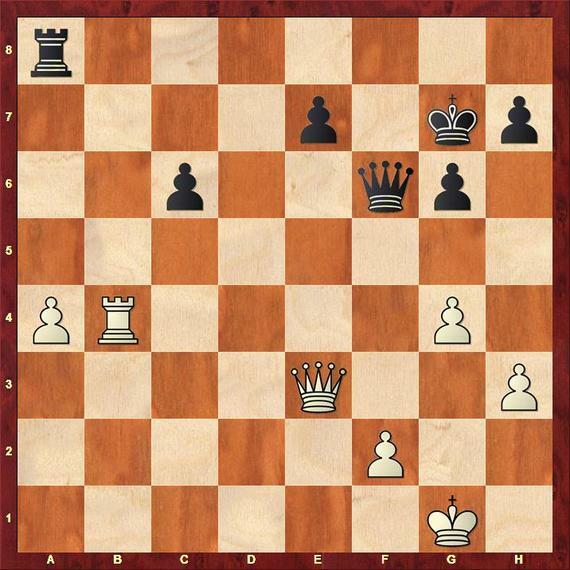 45.Qd2 Qxe6 46.Qa5 Qg4+ 47.Kf1 b5 48.Qc7 g5 49.Qb8+ Kh7 50.Qd6 b4 White resigned. Incredibly, the first two rules didn't help in Baku. As in Haifa other teams decided who got the gold. In 1976, we spent several excruciating hours in the lobby of the Dan Carmel hotel, where the Haifa Olympiad took place. The Dutch team needed IM Franc Kuijpers to beat the Finnish master Ilkka Saaren to clinch first place on a tiebreak, but after 14 hours and 111 moves the game was drawn. The final position in the game Kuijpers-Saaren. This position didn't change much in the last 30 moves. Kuijpers gave up trying and we won the gold. In Baku, the top medals were decided by a "byzantine" tiebreak, as Donaldson put it. It turned out that a tie between Estonia and Germany would give the gold to Ukraine. And it was headed that way, except for one wrong check. This position appeared in the game for the second time and Black again gave the wrong check. Bluebaum finally begins the victorious king-walk, securing the gold for the Americans. He played Ke3-f2 at first, but the white King needs to escape checks, marching forward via the queenside. The journey to the sixth rank starts with a retreat. 66...Rxb7 67.Bxb7 Qxb7 68.Qc6 wins easily. 67.Ka5 Kg7 68.Kb6 Qxh3 69.Qc7 Rxb7+ 70.Bxb7 Qxf3 71.d6 h3 72.e5 Qf4 Black resigned. Before leaving the Chess Olympiad in Baku several chessplayers created their version of John Lennon's song Imagine. The world chess champion Magnus Carlsen and the current U.S. champion Fabiano Caruana, who led the U.S. team to gold medals at the recent Chess Olympiad in Baku, will compete in a "tag-team" match at the Liberty Science Center in Jersey City, NJ (222 Jersey City Blvd.) on Thursday, Sept. 22 from 10:30 am till noon. Caruana and a designated player will challenge Carlsen and his teammate in a sort of chess doubles. Carlsen will also play a simo against 13 opponents, qualified via PlayMagnus app. Paul Hoffman, president and CEO of LSC, will comment on the play. It will be live-streamed via Norwegian TV. Both players believe that chess can have an impact on STEM education, favored by the Center. Note that in the replay windows below you can click either on the arrows under the diagram or on the notation to follow the game. Select games from the dropdown menu below the board. Grandmaster Lubomir Kavalek participated in nine Olympiads from 1964 till 1986. He played twice for Czechoslovakia (1964 and 1966) and seven times for the United States (mostly on the top board). He holds the all-time record of six team medals (one gold and five bronze medals) among American players. He achieved it with 25 different teammates.